I am working to read some classic novels. In all honesty, I thought Invisible Man was going to be a syfy type of novel. I was pretty far off of the mark. Really off the mark! This is the story of struggle, a black man’s struggles as he moves from the Jim Crowe south to the more open, free north. The transition is shocking to the invisible man. I cannot claim to know much about lives of blacks once they were “free”. But I’ve read enough to know that free wasn’t all that free back then. This article was published on Mar 25, 2019 . 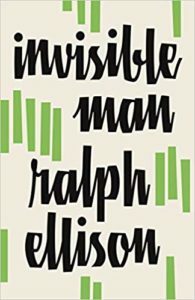 It is tagged Invisible Man, ralph ellison. You can follow any responses to this article through the comment RSS feed.